Note that next Wednesday, 15th November - there is nothing planned at any club location. New members and potential members of all fitness levels and abilities are welcome at all of these events. The full diary of club featured events is on the club website at: http://www.barunner.org.uk/Event Diary.shtml. Updated 2nd November. STOP PRESS - contents for this digest were finalised as my Oslo to London flight pushed back this evening. Since BA aircraft don't yet have WiFi this means that two late submitted items will need to be held back to next week's issue. Thank you to the first 27 respondents on the club survey. The graph below shows that, when asked or reminded, people respond within a couple of days. Fourteen did so after the issue of last week's digest and then another eleven after a reminder on Facebook. The survey remains open for the rest of the month so that the club committee can discuss all of its results at the next committee meeting on December 6th. 16 people have said they will probably come to the proposed Christmas event at the Five Bells on December 20th. That, and last week's quiz, is enough to make us confident that we can have the event there. We'll need to decide the food option to go with but we'll let others state their opinions before we commit. Ten people expressed interest in last Saturday's Cross Country matches and four others for subsequent matches. At least eight people have expressed interest in the BA sponsored Gatwick event - so clearly it is worth the club getting more information from BA and the event organisers for this event. With the Green Belt Relay we've had five people say they want to run, and we can probably guess who they are, but also another five have expressed interest in finding out more - which may make it easier for us to put together a full team this year. But so far no one has said they would like to help drive us round...well, we had to ask! But seven people have expressed interest in relay events for another time of the year - something for us to think about. Next year's WARR already has ten people saying they expect to make it and five expressing interest. Victoria could be a big one for us next September. More people have expressed interest in Track & Field than we had do our events last year - so hopefully we can find a way of turning interest into actuals. And with the other questions we'll have to go through the comments to better understand the feedback returned. The clubs annual quiz last week was considered a great success. We anticipated 25 attendees but on the night had nearer thirty and collected about £160 for the White Lodge charity. 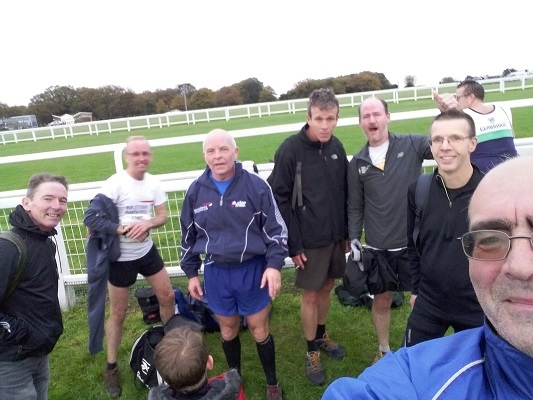 Nine of us took part in a training exercise run beforehand, using the western half of the Dream Mile course. The conditions were dry and very cold - which helped prevent us building up a sweat hence the lack of showers was less of a problem than it might have been. We then tookover the upstairs function room of the Five Bells in Harmondsworth and had baked potatoes with a variety of fillings, and their appeared to be plenty left over at the end. Then Linda and Steve ran their quiz with the usual format. There were six team competing for the pretitious pretentious prestigious certificates. There were three regular club teams, a team of Taylors (though two Taylors had to overflow onto one of the other teams), a team from Hayes and Harlington Runners and a local team from the Five Bells. The result was very close - perhaps the narrowest margin we've seen between bottom and top - so either the overflowing Taylors boosted the efforts of the Hayes And Harlington Runners...or held them back sufficiently to keep things level. Anyway, at the top a single point was the difference between the main Taylor team, and the Five Bells team - the winners being the Five Bells Team. Sadly the "BA Winners" certificate is unlikely to get displayed behind the bar due to the potential conflict with the "No third runway" posters. PS The day after the quiz I flew out to Sweden and eating in a Stockholm pub I realised they were having their pub quiz. I have to say though that their quiz was a lot tougher than ours ... I didn't understand a single question. The second ladies match of the season was held on 11 November at Nonsuch Park in Cheam. It was raining the night before and that morning, so we expected a good dose of mud. It did not disappoint! I was early, got there just as the local parkrun was about to start. The start of the parkrun was the same as the start of the cross country, so instead of getting out and setting up, I stayed in my car drinking tea, avoiding the rain and the many parkrunners gathering at the start. I know, I could have joined in! It was still raining when I finally set up under one of the trees near the start, and soon joined by Monica, Helen and Trish. I didn't know Trish was early too, and she ran the parkrun. This was also to be her first cross country race. The rain had drizzled down by start time, and running condition were good, weather-wise. It had been a while since I last run this course, because I was surprised by how flat it was. I had told Trish to expect hills! Thanks to Tom Rowley and Richard Ruffell for shouting out encouragements, and stopped by for a chat. The next match is on Saturday, 13 January at Wimbledon Common. We will be celebrating two of our ladies' birthdays that day (if they decide to run), and there will be some warming drinks (some may contain alcohol!) and birthday cakes. Runners and supporters are welcome. It is likely we have to offer a volunteer to the host, so any help from non-lady runners welcome. I'll circulate details nearer the time. We managed to get a full team out although with a few changes of personnel from last month. A special welcome back to Richard Ruffell, our most travelled participant who managed to combine this race with a parkrun and spectating at the Ladies Cross Country (both at Nonsuch park) and thank you to Colin Haylock who decided at lunchtime to run and test his injured hamstring in the race to good effect. Also welcome to Tim Bellars competing in his first Surrey League event and getting some good practice in for next week when he is half of the BA ASCA cross country team. parkrun seems to be used more and more as a warm up for cross country with at least 5 of us running or volunteering in the morning. In the absence of our usual lead runner Paul Knechtl we had occasional runner Duncan Wright to lead the team home coming in 47th place in a time of 33:59 closely followed by Chris Kelly. Special mention for Steve Hillier who limped home after having achilles problems, get well soon Steve. We came 10th out of 12 teams in the A league. At the time of writing, the cumulative league tables hadn’t been compiled. Anyone else interested in doing this let me know ASAP - currently it is just me and Tim Bellars. I need to register you for the ASCA event (including, but not only, for the run) and will be doing this on the Friday evening - cost 50euro. Note that although the ASCA Cross Country is the excuse to be in Dublin we are not skipping our Saturday parkrun. Tim and I will be doing the nearby Father Collins parkrun first, and we'll be joined at it by Ralph Behrens also. Perhaps more important than this month's results, or the observation that at Simon's rate of improvement, if continued for another two months, he will break the 4:30 mile record, is the news that the next Dream Mile will be on Thursday, December 7th, and should include seasonal Mince Pies and Mulled Wine at the finish. I emphasis the word "should" but it is probably worth running in hope and anticipation. The cross country league Saturdays usually cause a slight dip in our attendance figures at parkrun and it was no different this time around although some chose a gentle parkrun followed by a determined effort in the Surrey League a few hours later (XC in comments box). For the ladies, the venue (Nonsuch Park) allowed Trish McCabe two runs in the same place! Tim Bellars (25:10) made it six parks in six runs by visiting East Grinstead which is very much a cross country style parkrun anyway. That time is the new club record there. Alice Banks (26:13) visited Cassiobury parkrun in Watford for the first time. She has now chalked up 25 different parks in 99 runs so her century is just one Saturday morning away [see below]. Roderick Hoffman (29:35) and his sister Sarah Gordon (35:38) ran their and the club's first Swedish parkruns at Skatås in Gothenburg. That moves the club total onto 371 and their respective scores to 211 and 89. I will be running my 100th parkrun at Maidenhead this Saturday, the 18th. If any of you would like to join me at Maidenhead, it would be great to see you, there will be cake!!! Some results have been published for the Black Combe (HMP Haverigg) parkrun. In the first run there were 24 finishers and in the second 13 - consisting of one "first timer" and 12 on their second run, with nine doing PBs. The participants in the first week including four listed with previous parkrun experience - presumably staff and special visitors, and two of these were ladies. All of the "first timers" were male and had surnames of UK place names - so presumably not their real names. But it will be interesting when one of those runners becomes eligible to run at any of the other 450+ UK parkruns - will they retain their "inside" name so as to retain their counts towards free shirts? I'm planning on joining Ralph Behrens at Hannover on the 2nd - anyone else interested let me know. Unless you can run a fast marathon and get a good-for-age time or raise loads of money for a charity we all know that getting into the London Marathon is not easy. However there are thousands of marathons taking place annually around the world and BA employees, ex-BA employees and retired staff have access to cheap or even free airline tickets. Non-airline staff can also take advantage of recent falls in advance purchased ticket prices. So if you haven’t got into London you are in a good position to enter one of the other great city marathons of the world. I have found that it pays to plan ahead and book your marathon as early as possible as many races have race prices that rise the closer it is to race day. You can often save as much as 40% by entering early. Buying non-standby airline tickets early on is advisable for popular destinations and always much cheaper if bought well in advance. I often buy BA staff "Hotline" tickets – if bought early these are often cheaper than the staff ID90 fares! They include a hold bag as well which can make them cheaper than comparable Ryanair and Easyjet fares. If you are prepared to travel light and go from Luton, Stansted or Gatwick the Ryanairs etc. may also be a good bet. I find a three night stay works well for attending marathons in Europe – I usually travel out on Friday morning and back late Monday afternoon. This gives you plenty of time for exploring new places as well as registering and running your marathon. If you have entered a marathon requiring a long-haul flight it makes sense to combine this with a family holiday and stay for at least a week. If your other half is not a runner then make sure the destination has something to offer them – e.g. good beaches, stunning mountain scenery or shopping. They can usually be persuaded! There are a handful of overseas marathons that are as difficult as London to get a place – mainly the 5 other ‘Marathon Majors’ – Boston, New York, Chicago, Tokyo and Berlin. Of these Tokyo is the hardest – with ballot odds worse than London and no Good For Age entries. Berlin is probably the easiest of these to get a place in – roughly a 50/50 in the ballot, with Chicago next easiest. New York and Boston are quite difficult – despite the eye-watering entry fees! If you really want to do one of these and have been unlucky in the ballots then paying for a sports tour may be the answer – try 209 Events or Sports Tours International. Scott Snowdonia Trail Marathon – toughest and most scenic marathon in the UK! Midnight Sun, Tromso – running in the far north when the sun never sets! Finally, if your marathon is not on a Saturday, check to see if there are any local parkruns that you could do as a warm-up! I thought that I’d give the club a little feedback on the inaugural George Munday 10 km, which was located near Wisbech. It was a superb race, held by the relatively newly founded club, Three Counties Running Club. An incredibly fast, and totally flat course, with welcoming and encouraging marshals throughout the route. Had it not been for the very strong gales and the pretty cold temperature we have had today, I am sure that we all would have been able to run even faster. After we all observed a 2-minute silence, it was off into the unknown, straight into an incredible headwind. It was very hard work today, constantly struggling against the gales for most of the time. The scenery was ‘probably’ very nice, a typical fenland scenery but, with everyone keeping their head down, me included, I don’t remember much of that at all. Instead, we all knuckled down to the job in hand, trying to overcome the very cold gales, just beavering on. However, despite the gales, I managed to knock off yet another whopping 2 minutes 14 seconds from my previous best 10 km near Munich, finishing in a totally unexpected new PB (for this year) of 1:01:24. To say that I was chuffed to bits about that would be a total understatement! We received a really great goody bag, which contained a high quality, heavy poppy medal, a pedometer, a bottle of water, a Mars bar and some sweets. Coffee, tea and cakes were waiting for us to grab afterwards, apart from the bananas at the finish. Oh, and we also enjoyed electronic timing, something we all appreciated very much. There was a total of 198 runners. All in all a great, and very friendly atmosphere. So, if any of you are ever up in the Fens, then that 10 km would almost certainly guarantee you a PB, gales permitting!!! Another club finisher in last week's New York City Marathon was Lissa Prichard in a time of 3:58:11.